Young men from throughout Virginia, 17 other states, and five foreign nations came together yesterday in the Fishburne Military School quadrangle to form the 2017 – 2018 FMS Corps of Cadets. 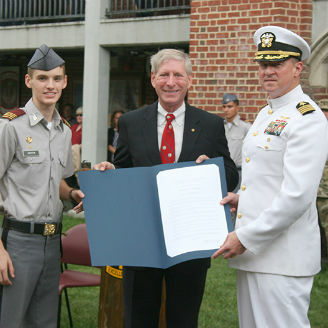 Delegate Landes presents Fishburne Military School Superintendent, CAPT Mark Black USN(Ret), and Battalion Commander Cadet Phillip Griffin with a copy of House Joint Resolution No. 814 honoring the life of JB Yount III. This traditional ceremony marked the official beginning of the school’s 138th consecutive session and its 99th year as a United States Army Junior Reserve Officers Corps (JROTC) Unit. Delegate Steve Landes (Virginia House of Delegates, 25th District) briefly addressed the Corps before reading and presenting the school with a copy of a resolution he sponsored honoring the life and service of J.B. Yount III, FMS Class of 1956. House Joint Resolution Number 814 (http://lis.virginia.gov/cgi-bin/legp604.exe?171+ful+HJ814) reads, in part: “RESOLVED by the House of Delegates, the Senate concurring, That the General Assembly hereby note with great sadness the loss of Joseph Byron Yount III, a public servant and community leader in the City of Waynesboro”. During the course of the First Formation ceremony, the Cadet Officers and NCOs for 2017-2018 were announced and called forward to receive their rank insignia. The Cadet leadership was then sworn in by Fishburne’s 12th Superintendent, CAPTAIN Mark Black, USN(Ret). Before the assembled crowd of alumni, family, friends, local veterans as well as city and state officials, the Cadet leaders each took command of their respective units and the Fishburne Military School Corps of Cadets for 2017-2018 was officially formed.